My doppelganger is way skinny. Was flipping through my Title 9 catalog and found my good twin. Apparently she also spells Tracy the proper way, is a brunette, likes wearing chartreuse and owns a metallic blue VBA. But we do not share that same biceps. Sigh. I won’t even comment on the tongue thing. This entry was posted in Media by Tracy. Bookmark the permalink. 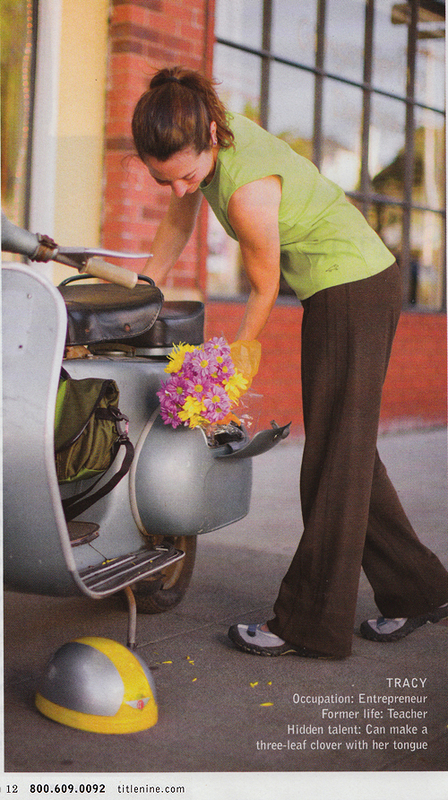 Ha…I just got my catalog the other day and totally thought of ‘Scooter Swag’ when I saw this picture in there!